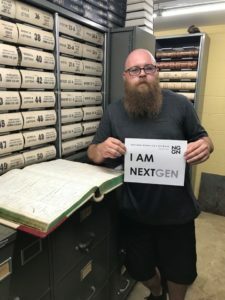 The NextGen Genealogy Network is excited to launch our latest initiative – NextGen In Action! We want to see photos of young genealogists like yourselves in action – researching at a repository, visiting the cemeteries, at genealogical conferences – you name it! 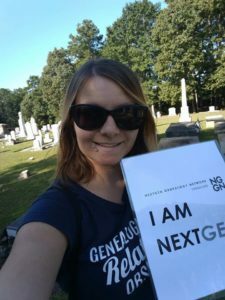 Snap a photo of yourself holding the ‘I am NextGen’ sign or wearing some NextGen merchandise (found at our Zazzle store). Post it any of our social media sites using the hashtag #nextgeninaction, or email us at info@tnggn.org. Once a month, all your NextGen in action photos will be posted on our blog. We can’t wait to see you all in action!